We do all the things that every other plumber does with one important difference… we come when we say or you don’t pay. I’m Kevin Johnson, I own and operate the business with my wife Raewyn. You can find out more about our team on the meet our plumbers page. We thought about how horrible it is when you’re standing around waiting for a tradesperson who hasn’t kept their word. That’s when we decided to offer you the on time promise. We are committed to giving you high quality products at wholesale prices. We’re not interested in using cheap, DIY type products. We beleive you’ll be happiest if we come and do the job once with a long lasting product. We are service agents for Methven Tap Ware, Mono Pumps, and Devan Waste Water Treatment Systems. We have our own Mico Plumbing branch on our premises at 20 Glasgow St, Tauranga (customers are welcome). We also use the latest technology, so we can save time, and save you dollars. This includes equipment for locating cables, leak detection and drain cameras. We belong to Master Plumbers and carry the Master Guarantee, to give you extra peace of mind. We also stand behind what we sell, the high quality products we use carry supplier guarantees. We are a family owned and operated plumbing and drainage company servicing the wider Bay of Plenty area. We cover all aspects of plumbing, including repairs and maintenance, drainage, renovations and new homes. 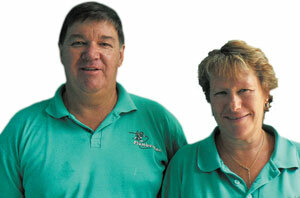 We have been in business in Tauranga for over 30 years and we established PlumberMan (Tauranga) Ltd back in 1995. My father and my great grand father were plumbers and my sons are plumbers the Johnson name dates back in excess of 100 years, more than four generations in the plumbing and drainage industry.